Model number recycled in 1990's as a "pro" alto. Model number recycled for the Artist low A baritone. Model number recently recycled for a new "pro" low A baritone. Model number recycled for the Director alto. May not be an actual model. Model number recycled for the Director 18M student alto in the 1980's. Model number recycled in late 1980's as a student alto. Probable model number. Model number recycled in 1990's as a student alto. "29M" is probably the model number that would have been used for the planned Connstellation tenor, but this horn was never built. Probable model number. Haven't seen one. Conn started referring to horns by model number after Carl Greenleaf bought the company in 1915 (the practice probably started in 1922). There is some dispute as to when the model numbers (i.e. "6m", etc.) started appearing on horns, however. This appears to be as late at the early 1940's, but I believe this practice started around 1935 with the introduction of the Artist ("Naked Lady") horns. As noted, Conn recycled their model numbers more than once. They also did the same with serial numbers in 1976 -- and some serial numbers on Conn's lesser models (i.e. student horns) in the mid 1960's to 1980's had unique serial numbers that have not yet been charted. Thes horns also tend to bear interesting model numbers (18M, 50M, etc.). Most or all of them were produced in Nogales. Pan American horns, as with most stencils and second-line models, have their own, unique serial number chart. I believe "1M" never was introduced as a model number. Odd numbers referred to a HIGH PITCH model, in most cases, though. Finally, I'm asked often about serial number and model charts for Conn stencil horns: there are no official charts for either. Stencil serial numbers starting with a P APPEAR to be +50,000 off on the Conn serial number chart for split bell key horns (i.e. a s/n P2xxx horn. 50,000+2000=52,000. According to a Conn s/n chart, 52,000 was made in 1919) and appears to be at least 200,000 off for LH bell key horns. Conn stencil model names are NOT consistent. Stencils were not exclusively made by one company, but by either the lowest bidder or whomever had the best relationship with the storefront. 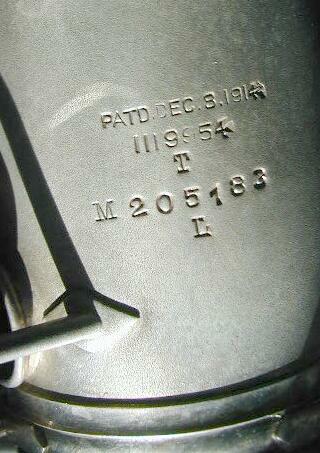 So, for example, Lyon & Healy horns were made by Buescher, Martin, Conn and Holton at different times. This is probably part of why there is no stencil serial number chart. Click HERE for my in-depth article on stencils and HERE for my in-depth article on low v. high pitch. As an example, of course. * The date and 1119954 refer to the Haynes tonehole patent. This was on most pro Conns from 1914-ish to 1960-ish. * The letter "T" means "tenor" (A=alto, S=soprano, C=C instrument, etc.). This was later simplified to B, for Bb instruments and E, for Eb instruments, so if your horn has a "B" on it, you may have a tenor, baritone or bass. * The "M" just means "saxophone". The number that follows is the actual serial number (in this example, 205183 -- which corresponds to 1927). * "L" means "low pitch", i.e. standard, everyday A=440hz. If the horn says "H" you've got a high pitch horn, A=457hz. * "Model VIII": this refers to a 6M with a modified neck. These horns are allegedly the best playing 6M's. * "X" after a serial number: no one is 100% certian what this refers to, but it appears to mean "eXperimental". These horns may have additional octave vents, additional keywork or a modified neck. * The following letters preceding the serial number and the horn DOESN'T have split bell keys: C, E, H, K, L, M, N, P, R. These horns were manufactured from 1963 to 1972. The letter is part of the serial number. * A letter after the serial number and the number has (generally) less than six digits: the horn is an intermediate or student model manufactured from 1963 to 1980 (or so). There is no available serial number chart for these horns. * "METRO" (generally on the neck): a modified neck design. This is sometimes an overslung octave key on a 6M/New Wonder horn and is occasionally referred to as a "New York style" neck. * "P" preceding a serial number: this means "a Conn-made horn, but not our pro line". This is generally found on Conn stencils, but is also found on the Conn Liberty and other Conn-labelled horns. I think it can be reduced to, even, "this horn was made with older tooling" or "this horn doesn't have rolled tone holes". I had though that "P" indicated that a different tone-hole layout patent was used (other than the Haynes one), but that theory has proven to be incorrect (in other words, "P" does not = "Pan American Style"). Older Conns also tend to have union labels engraved. Some have the engraver's name on the bell, body or even under a key! Finally, a rare instance noted by Paul Cohen:in the May/June 1997 issue of the Saxophone Journal: occasionally Evette & Schaeffer contrabasses were stamped with the Conn name to get around import duties (Conn themselves never produced contrabasses). I've proven the converse of this: I've found a Conn Wonder alto with the Evette & Schaeffer name, Carl Fischer importer engraving and Evette & Schaeffer serial number. It's freaky. Check it out!